NIGERIA – In a video released on Saturday, the leader of an Islamic terrorist group vowed to attack Christians and threatened to mutilate and decapitate victims. 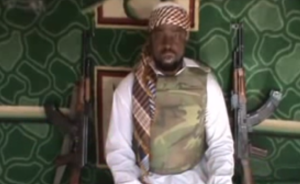 Abubakar Shekau is the leader of Nigeria’s Boko Haram, a group that seeks to force Sharia law upon Nigerians. For several years, Boko Haram jihadists have wreaked havoc in northern Nigeria, with thousands of Nigerians displaced from their homes. Boko Haram fighters are particularly hostile toward Christians in Nigeria; according to reports, over 700 Christian Nigerians have been killed in 2013 alone due to Boko Haram-related violence. As recently as Saturday, twelve people died when Boko Haram insurgents opened fire during a wedding ceremony in the predominantly Christian village of Tashan Alade. In Shekau’s video, which was emailed to several journalists, he claimed responsibility for a December 20th attack on Nigerian tank battalion barracks, but credits Allah with the success of the assault. Then Shekau claimed his men would have eaten their victims’ bodies, if commanded. According to reports, Shekau’s statements in the video were frequently interrupted by loud shouts and laughter from Boko Haram militants. Mallam Isuwa Hyelkuzuku, a Nigerian who lives in Kwajjafa, said villagers are not surprised by Boko Haram attacks. However, they do not understand the attackers’ rationale.